Children can be captured on film successfully in many different circumstances and locations. For most children, getting their photograph taken is fun and they will perform for the photographer. This in turn brings their personality to life on film. There are a few simple steps to successful child photography besides the usual photographic skills. Take the photograph from the child’s level. Avoid standing toweringly over a child when taking their photograph; keep the camera at about eye level of the child. Be quick and decisive with the camera. Don’t delay in taking a photograph; children can very quickly get bored. If possible, plan your photograph in advance and have everything ready. For outdoor photographs or shots using available light, use as fast a shutter speed as possible. Children move frequently and quickly, often becoming a blur in a photograph. Make taking a child’s photograph fun. Make a game of taking their photograph. Have them play acting or let them dress up. Under no circumstances show a loss of patience with a child or force them to pose when they do not want to. Outside of the moral issues involved, you are never likely to get the image you are looking for in this situation. If the child is not interested, quit and try again another time. Note: Be careful taking images of children that aren’t yours! You may be innocently capturing them at play but there are those around who may have different views. Ask the parents permission first. Be safe, happy shooting. We have here a few sample images to get the old brain cells into the creative mode. This image shows what can be done with a little interaction between photographer and child. Playing dress up games often leads to good images of children. 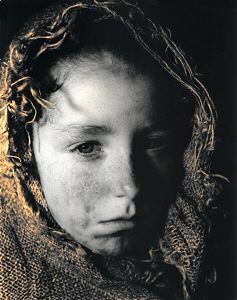 The child wrapped herself in a burlap cloth in the fashion of a shawl and rubbed her face with charcoal for a “dirty” effect. Strong side lighting from a lamp was used to create hard, angled shadows to bring out the textures. The image was shot using black and white film. The print was then selectively sepia toned by masking the child’s face with petroleum jelly. This can later be removed with dishwashing soap and water. 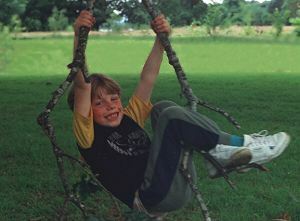 Good natural images can be achieved while children are playing. Good locations are in a garden, park, playground or theme parks. This image was taken in a park and has a very natural appearance to it. The important thing to remember when taking shots like this is to use fast shutter speeds, this helps to freeze movement. Focusing should be spot on with enough depth of field present for the subject but still throwing the background out of focus, this gives more emphasis on the child. Children can be composed in an image in many ways. This is an alternative approach that would be unusual to most children’s photographs. 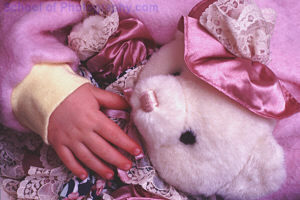 Rather than including the child’s face as the most important part of the image, a close up shot of the baby’s hand and her Teddy bear has been composed very nicely. By isolating details you can present more interesting aspects of the subjects character, here for example, softness is the key. Babies are very cute and their new parents are forever photographing them. In most cases the composition of the image is seldom taken into consideration. The only worry is to capture the baby’s expressions and actions. In this image the whole scene is carefully composed. Using high key colours always suits baby pictures best. 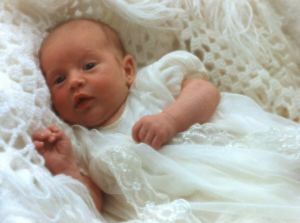 The use of a soft focus filter can add a romantic feel to baby images and are available at a very reasonable cost. You could of course make one yourself with a UV or skylight filter with some vaseline spread over it.